It could have been worse. Though the S&P 500 closed with a loss of 0.94% on Thursday, that’s a significant improvement on the intraday loss of 1.6%. Some opportunity-minded traders weren’t terribly afraid to already step into the dip. Had it not been for names like General Electric (NYSE:GE) or Advanced Micro Devices (NASDAQ:AMD), the market may have even been able to fight its way back into the black. GE stock fell nearly 4% yesterday after Fitch cut its ratings outlook on the struggling company from “stable” to “negative.” AMD fell 2.5%, as investors continue to wonder what the company’s future plausibly looks like. There were still a handful of winners … names like Chipotle Mexican Grill (NYSE:CMG), which gained more than 11% after an earnings beat became validation of its turnaround effort. There just weren’t enough stories like Chipotle’s. As the week winds down, it’s the slightly less volatile names like Regions Financial (NYSE:RF), Fortinet (NASDAQ:FTNT) and U.S. Bancorp (NYSE:USB) that look ready to make reliable moves. In all three cases though, one more piece of the puzzle needs to be placed. Regions Financial got off to a great start yesterday, as did most names … and banking stocks in particular. 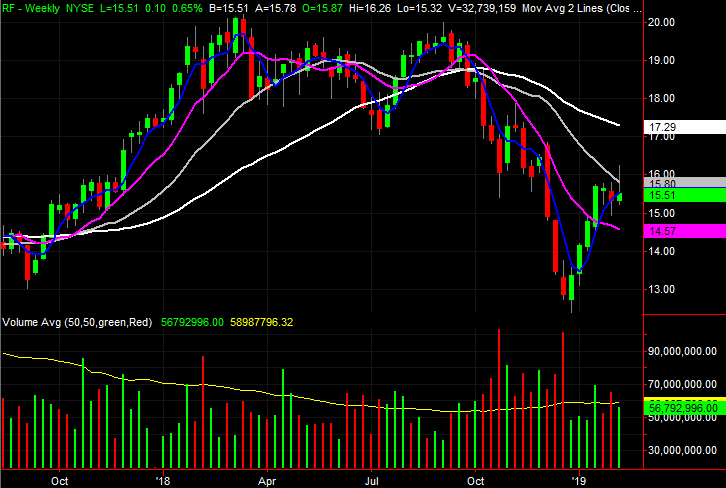 The stock pushed up and off its 20-day moving average line, seemingly shaking off recent weakness. Its bump into its 100-day moving average line, however, put an alarming degree of profit-taking into motion. Though so far the failed breakout move can be chalked up to volatility, a little bearish follow-through could actually do a lot of damage. • The volume spike is telling. You can’t see it on either of our stock charts, but on an intraday chart it becomes clear there was more volume behind the selling than the buying. And, it started quite early. The strong open never has much support. • We still have to respect the potential support at the 20-day line, plotted in blue, which has kept RF shares propped up for the past week. • A break above the gray 100-day moving average line still can’t be ruled out, but given Thursday’s action, a close above that level has become a prerequisite for any new long entry. Curiously, though not surprisingly, Regions Financial wasn’t the only banking stock to wave red flags on Thursday. 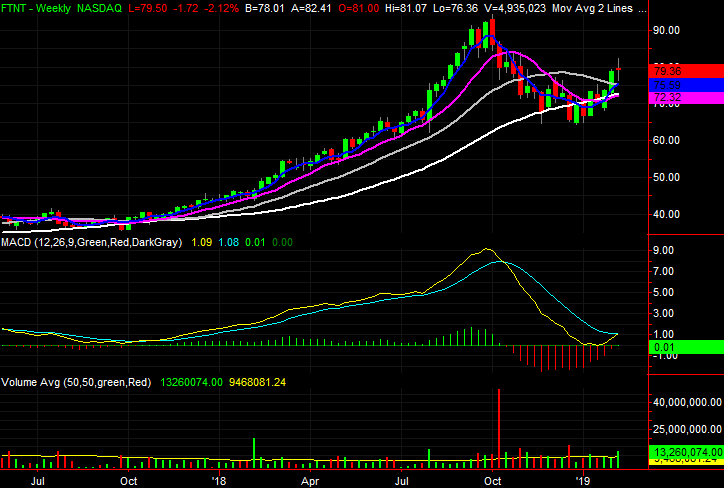 U.S. Bancorp did as well. But, it waved a different red flag. Regardless, current owners have good reason to be concerned. • The weekly chart puts things in perspective, though the worry is only evident on the daily chart. While USB stock has rallied nicely from its December low, the recent test at the white 200-day moving average line seems to have ended in failure as of Thursday. • The shape of yesterday’s bar is just as concerning as its location. It’s almost a complete engulfing pattern, meaning Thursday’s open-close range expands the prior day’s entire high-low range … turned in the other direction. Also “engulfed” were the 200-day moving average and the 100-day moving average lines. • While yesterday signals a potential pivot, such clues generally require confirmation in the form of a lower close. Finally, in late January we noted Fortinet shares were trapped in a trading range, between $64.50 and $75.70. At the time, the stock looked content to not only remain in that range, but remain in the very middle of that range. It didn’t. The bulls finally took charge, forcing Fortinet up and over the upper boundary earlier this month, clearing another major technical hurdle in the meantime. Shares have peeled back since then, but found a telling floor as of yesterday’s session. • The shape of yesterday’s bar is noteworthy. 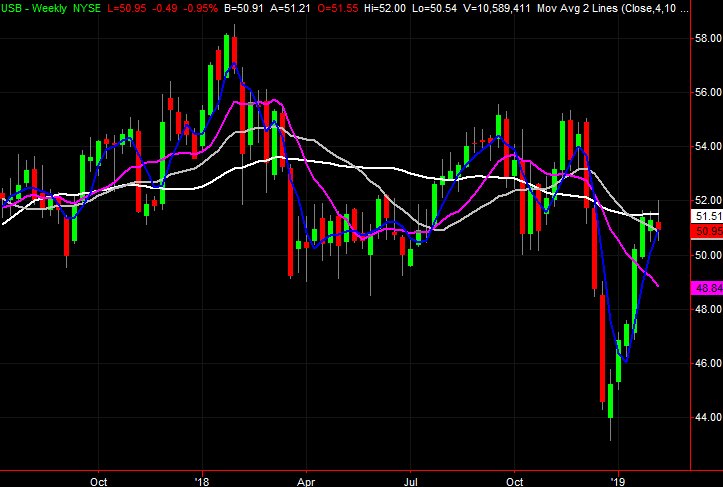 While FTNT closed at a loss, it also closed well above the low. Buyers were pouring back in as the closing bell rang. • Also noteworthy is where the floor was found. All it took as a kiss of the gray 100-day moving average line to pivot back into buying mode. • While the stage is set for a “second wave,” before Fortinet is buy-worthy it needs to confirm the pivot with a close above Thursday’s high. The post 3 Big Stock Charts for Friday: Regions Financial, Fortinet and U.S. Bancorp appeared first on InvestorPlace.